Email targeting is what gives email marketing its incredible ROI. By this point, you’ve heard about how powerful email marketing is. You’ve seen one of the many email ROI studies that shows 38 to 1 (or 44 to 1, or 40 to 1) return on investment for every dollar spent on email. Email marketing lets you have a one-on-one conversation with your audience. It’s a platform that you own—no one can ever take away your email list. And all of that is true. But it’s also incomplete. One-on-one conversations are powerful, but not every one-on-one conversation is created equal. Is a conversation you have with the barista at Starbucks the same as the one you have with your closest friends? What about conversations you have with your mom? Email marketing is useful because you can have direct conversations. What makes it powerful is email targeting—the ability to customize your messages to have different one-on-one conversations with different members of your audience. That’s why, when you choose an email service provider, you’re looking at way more than just the ability to send email. Great email software gives you the tools to send targeted emails. To do email targeting, you need to be able to tag subscribers based on the actions they take. See what people are doing on your website. Customize the content of each message for the person receiving it. Great email software includes all those features. To do real email targeting, you need to go beyond basic email marketing. Here are 6 specific features to look for when you’re choosing your email software. Tagging is fundamental to email targeting. Without tagging, you can’t properly do email targeting at all. A “tag” is exactly what is sounds like. It’s a label you add to a contact, so that you can use them later to get vital information. That might sound unremarkable. But when you think of the implications of being able to track anything your contacts do, the power of tagging becomes clearer. If you want proof of the power of tagging, look no further than Jennifer Tilney, founder of Platinum Skin Care. Platinum Skin Care sells skin care products that are customized to each person’s skin type. Ultimately, that’s great for the customer—but the sheer number of products makes it difficult for website visitors to find what they need. So Jennifer used a lead generation quiz, combined with tagging, to give people what they needed. When website visitors complete the quiz, they enter their email address to get their results. They also get tagged based on their skin type and skincare needs. Then Jennifer follows up—with a custom product offer based on the tag. 17% of the people who go through this tag-based funnel become paying customers. That’s the power of tagging. When someone takes any action related to your business and marketing, you can attach a tag to them. Then you can see that tag forever. You’ll always know what that contact is interested in. Someone clicks on a link in one of your emails. You can tag them as interested in the topic of that link (and then follow up later). You can tag people based on how engaged they are with your emails. If they aren’t opening or clicking, you can tell—and follow up to re-engage them. You can tag people based on which products they’ve bought. Whether they are a member of any of your programs. How they came to be on your email list—and even which pages of your site they visit. All of that lets you track what people are interested in. When you can sort by tags, your email targeting can customize messages based on those interests. Tagging is what helps all the features of your email marketing software work together. It lets you segment your contacts and trigger automations — and all the tracking power of email software comes from the ability to add tags based on behavior. Ask yourself: Does this software let me add tags based on my contacts’ behavior? Once you have a contact in your system, you want to be able to track the activity they take. What are your fans doing on your website? If you don’t know, how can you be sure that you’re actually showing them the stuff they want to see? When someone visits a page on your website, that’s an indicator that they’re interested in the topic of that page. And if you have website tracking software combined with your email provider, you can use that information for anything in your email marketing. When you have website tracking, a whole new world of information opens up to you. If someone visits a page for one of your services, you can tag them as interested in that service—and then follow-up with more information. If they visit a ton of different pages, you can tag them as being highly engaged. Remember: any activity on your website is an indicator of some intent. When you know what your contacts want, you can give it to them. Ask yourself: Does this software let me see what each contact is doing on my website? People do stuff. And not all of that stuff happens in emails. Payment processing, membership sites, ecommerce stores, landing pages, opt-in modals, data analytics, and social media. Modern marketing uses a wide range of technology and software to solve an equally wide range of marketing problems. That software stack lets marketers do things that used to be impossible. But it also creates a new problem—all your different apps need to talk to each other. What if you use a membership website, and want to be able to send emails directly (and only) to people who are members? What if you have an ecommerce store, and want to send different offers to people who have purchased different items? What if you want to track payments, and use payment information to add tags and follow up on client purchases? What if you want to personalize the content on your website based on engagement with emails? What if your sales team is in contact with someone, and your email provider can’t communicate with your CRM software What if you want to be able to retarget people who are on your email list with Facebook ads? All of these are pretty standard uses of technology in modern marketing. But they become much harder—or even impossible—if your email marketing software can’t integrate with your other software. Integration is crucial. If your email software can’t integrate, it can’t use the information it gets from other apps to create targeted emails. When you choose your email marketing and marketing automation software, look for integrations. Ask yourself: Does this software integrate with my favorite apps and platforms? Can you change the content of an email based on who you’re sending it to? Imagine you run a restaurant with the most amazing filet mignon. Bear with me—this is a simple example, but it makes the point. This steak is juicy. It’s succulent. Your cooks get the perfect amount of sear, so that it’s deliciously rare without mooing on your plate. You want to send an email about your restaurant. And because the steak looks beautiful and mouthwatering, you want to have a picture of it front and center. You figure that people expect to see pictures of delicious food in an email from a restaurant. So you send one. But wait. What about the vegetarians? Dynamic content helps you avoid situations like this. If you know that someone is a vegetarian (which you could track through their link clicks, a segmentation email, or custom fields on your subscription forms), you can make sure you don’t send them a steak that they’ll never eat. 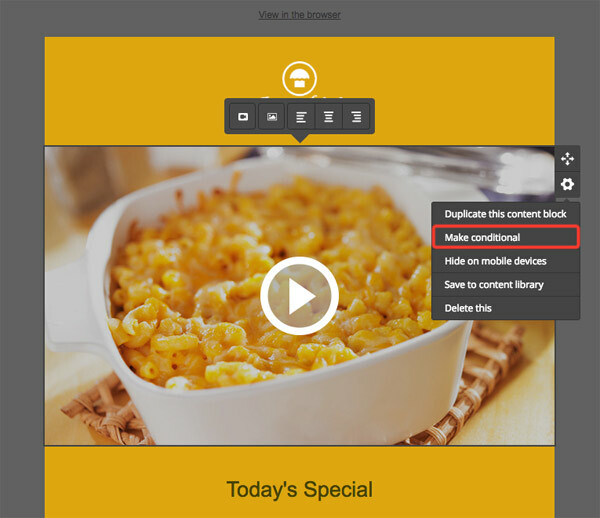 With dynamic content, you could set your email to deliver the steak picture to meat eater—and send vegetarians a picture of your kale salad or mac ‘n cheese instead. The restaurant is a simple example, but dynamic content can help any business that serves multiple types of people. Any time you’re trying to get two different groups of people to take the same action (in this case, come into the restaurant) dynamic content can come into play. Dynamic content is a key feature of a good email service provider. It gets stronger when you have more data about your contacts. Show different product pictures and highlight different pain points in your email copy. Generally use dynamic content to speak more personally to your audience. Ask yourself: Does this software let me dynamically change the content of an email? You need to be able to track what kind of success you’re having with your emails. Are people engaging with you? Are emails creating more customers? Are emails helping you get more from your existing customers? If your email platform doesn’t do anything but “send emails,” you can’t really tell what’s working and what isn’t. Sure, you can look at things like open rate and click rate—but those are only half-measures at best. What about conversions? What about sales? What about repeat sales? A good email service provider lets you track those things. A great email service provider lets you track any goal you want—because the specific goals worth measuring are different from business to business. You need to be able to see how your marketing funnel performs. Goals and goal reports show you the numbers, and give you visibility into what’s working and what isn’t for your marketing. But there’s more. Tracking goals helps you do better email targeting. When you have the information from goals in your system, your email targeting can take into account what goals have and have not been achieved. Has a contact achieved a goal? Send them to the next step of the funnel. Are they stuck in your funnel, one step away from reaching your goal? Use targeted emails to follow up and move them along. Ask yourself: Does your email marketing software let you track and segment based on conversions? Marketing automation has killed email marketing. The email marketing industry is exploding with marketing automation. It’s just not enough to be able to send emails any more—you need to be able to track emails, create segments, and put contacts through an automated funnel. The shift in the industry has led to more advanced email marketing tools. Tools that let you automate huge parts of your business. Sometimes that means taking a manual task and using automation to make it easier. Sometimes it means finding a hole in your funnel that would be impossible to fill manually. Heather Read is a professional family photographer who had a problem with manual tasks. Because of some smart local SEO, she had no trouble attracting leads to her business—the trouble came when it was time to follow up. Automation came to the rescue. By using an automated sequence of emails to respond to contact requests, Heather was able to showcase her style and qualify her leads—and save 10 full hours a week. Automation filled a hole in Heather’s marketing—one that she was working to fill manually. 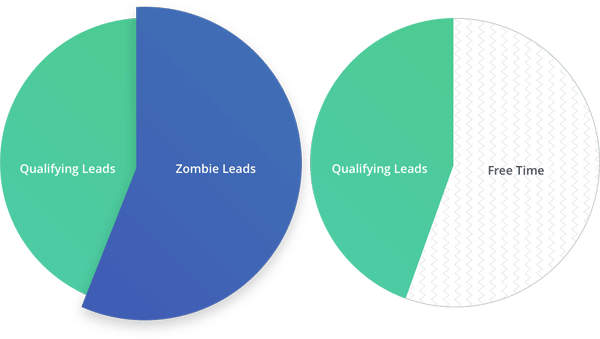 Qualifying her leads automatically helped her improve the overall efficiency of her business. And that’s not the only type of hole automation can fill. One of the biggest holes automation fills is email targeting. 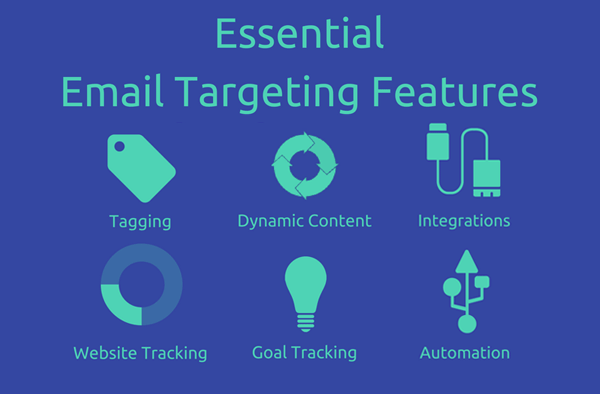 So far, we’ve covered different features that help you get the information you need for email targeting. We’ve talked about how tags help you record that information. Automation is what lets you actually use that information to make your marketing more efficient. When someone signs up for your email list through a specific web page—automation is what lets you send targeted follow-ups specifically about the topic of that page. When a contact gets most of the way through their registration process, but stops—you can use automation to send follow-ups that prompt them to finish the process. Whether it’s abandoned cart emails, emails promoting a service, emails triggered by a visit to a specific web page, nurture campaigns focused on a specific interest, or emails that send after contacts take specific actions—automation lets you send emails to your contacts at the right time. Automation helps you target your emails at any time, and based on any information—even if you’re asleep, in a meeting, or trying to target 15 different segments at once. Ask yourself: Is your email marketing software just email marketing? Or is it capable of marketing automation? When you want to do email targeting, a flexible automation platform is key. So when you look and email marketing software, make sure you’re thinking about marketing automation software as well. Does this software let me add tags based on my contacts’ behavior? Does this software let me see what each contact is doing on my website? Does this software integrate with my favorite apps and platforms? Does this software let me dynamically change the content of an email? Does your email marketing software let you track and segment based on conversions? Is your email marketing software just email marketing? Or is it capable of marketing automation? It’s not enough to have email marketing. When you can have real, one-on-one conversations with individuals, you can take your marketing to another level. 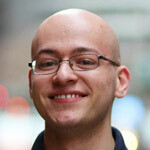 Benyamin Elias is a content marketer at ActiveCampaign. He’s created content strategies for Fortune 500 companies and small businesses alike, and specializes in email marketing, copywriting, and the creation of targeted content that converts.